Polished finished: Case edges, inner rim of bezel & 5 minute increments of bezel ring. Brushed finished: Case top, bezel edges & case back. Polished steel crown with black rubber rim for enhanced grip. Polished steel chronograph push-buttons with black rubber inserts for enhanced grip. Unidirectional rotating bezel with a black ceramic fill and with engraved silver minute indicators. Black dial with a horizontal streak effect and recessed sub-dials. White minutes/seconds track on the outer edge of the dial. Applied polished steel index hour markers with luminescent fill. Polished steel hands withluminescent fill. 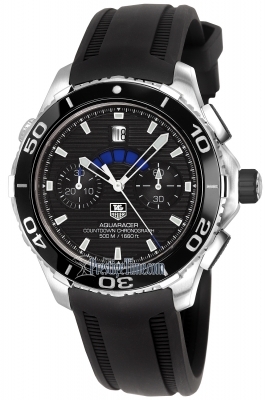 Large polished steel, blue tipped central seconds hand. 30-minute counter located at 12 o'clock. 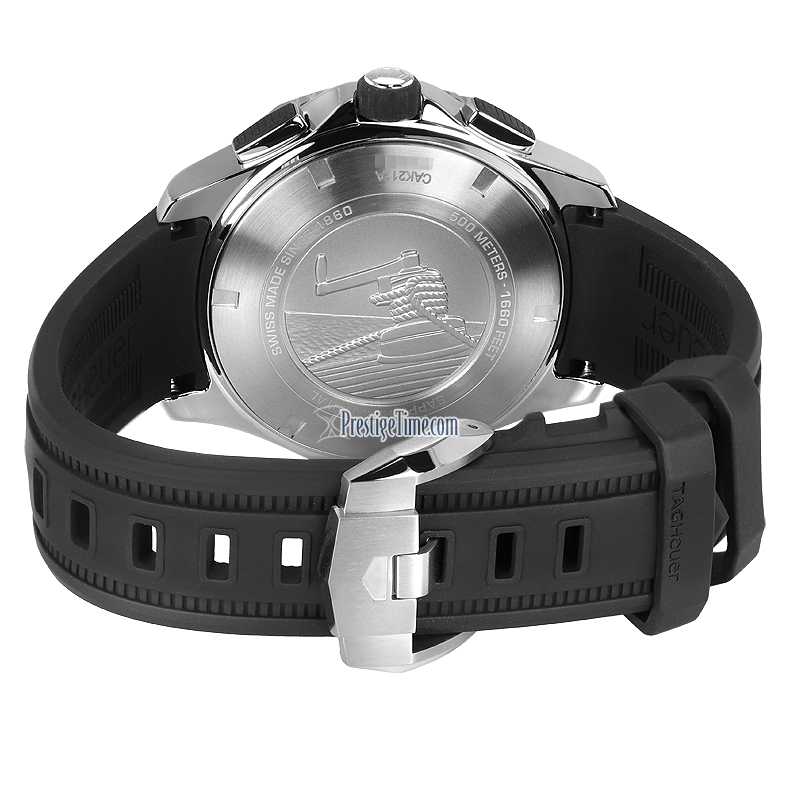 In addition to the standard stop-watch features, this watch features a 15 minute countdown indicator. Countdown is displayed via a 5-window display located directly beneath the date window, Each window represents 1 minute. There are 3 sets of colors each lasting for 5 minutes: blue grey & white. Small running seconds counter located at 3 o'clock. Date window located directly beneath the 12 o'clock position. Automatic helium escape valve on the case side at the 10 o’clock position. 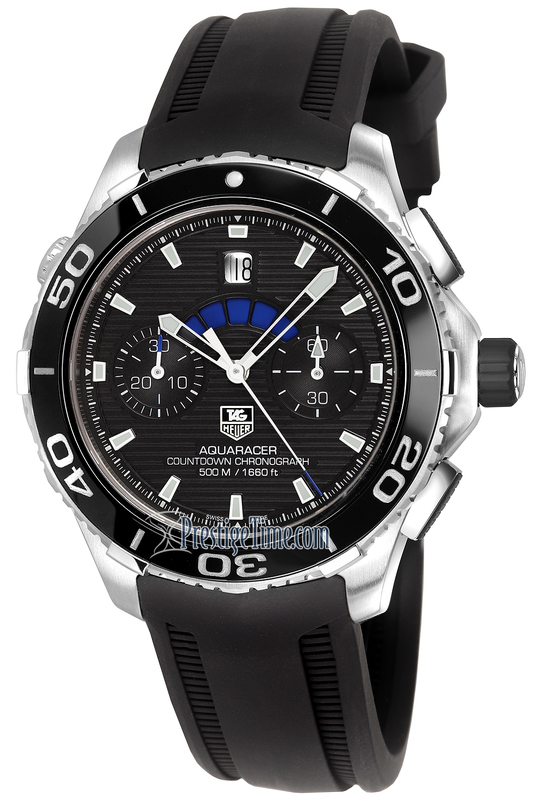 TAG Heuer Calibre 5 automatic chronograph movement, which beats at 28,800 vph, contains 26 jewels, and has a power reserve of approximately 42 hours.